An approximate 12% increase in shipping from US steel mills was seen in the first half of 2012 compared to 2011 figures, despite a 5% drop in shipments between May and June. According to data released from the American Iron and Steel Institute, 50.1 million net tons were shipped between January and June of this year. In current figures, domestic raw steel production dropped by 1.2% from the week prior to a total of 1.876 million net tons, easing the capacity utilization rate to 75.9%. An $83 per ton surcharge hike was announced by Nucor on all carbon and alloy plate to a total of $248/ton. 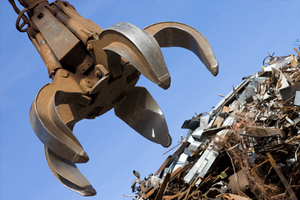 Nucor cited the increase in AMM’s shredded auto scrap index as the reason behind the hike. Steady growth was reported across the board for ferrous scrap this week, with the composite price for shredded being listed at $396.83/gt at Scrap Price Bulletin. This figure is unchanged from last week’s report, but up sharply from last month’s rate of $312.50/gt. The months of May and June this year were hard on the industry, with ferrous prices dropping by approximately $130 per tonne. These challenges were highlighted in the 2012 fiscal report released by Sims Metal Management this week, along with a slowed intake in June, which caused them to significantly lower their buy prices. SMM stated that they were able to maintain their position steadily with sales/inventories, but that they were not able to drop their buy prices fast enough in relation to the drop in ferrous selling prices. SMM was encouraged that the ferrous markets held steady in the month of July, allowing them to increase prices recently at a significant rate. Their spokesperson stated that they expected to see ferrous prices trading at current levels over the next term, and that they were anticipating liquidity in the deep sea ferrous markets over the next few weeks. SMM stated that they believe the recent stabilization of the ferrous market would improve intake in the coming months. A report was released this week by the International Copper Study Group, which revealed that the refined copper market was currently in a global deficit by as much as 21,000mt in the month of May. Demand continues to be greater than supply, bolstering year-to-date figures as high as 405,000mt. Global copper usage grew over 8% between January and May, with a 94% surge in net imports from China boosting China’s overall consumption rate by 30%. Production of refined copper has increased 4.5% globally in 2012, however output in both Chile and the US have declined. Despite the overall increase in production, the increase in consumption by China has left the market in a deficit. Solid gains were posted this week in non-ferrous trading prices. LME 3-month nickel prices traded as high as $16,500/mt, settling at $16,489/mt after spending most of August well below $16,000/mt. LME 3-month copper was up around $7,663/mt and aluminum was up around $1,920/mt as well. Copper scrap also held firm this week with reports from AMM of brass ignot makers prices between 343-345 cents for Bare Bright, No. 1 selling at 312-316 cents and No. 2 selling at 214-218 cents for radiators, 182-186 cents for turnings and 207-210 for yellow brass solids. By the end of the day on Friday, COMEX September copper was down about a penny to settle at $3.4812/lb. According to the International Lead Zinc Study Group, the global markets for lead and zinc continue to be in surplus. The data released in their report this week showed that the global market had a 48,000mt surplus between January and June, with lead production increasing by 0.4% and demand dropping by 1.6%. Zinc is still in surplus despite a 1.1% decrease in output and a 0.3% increase in usage with a 152,000mt surplus in the first half of 2012. However, it should be noted that both lead and zinc surpluses are down compared to 2011 figures. The value of plastic scrap exports in the US dropped from $79 million in the month of May to just $63 in June. Volume also dropped between May and June from 168,000mt to 143,000mt, bringing exports to the lowest level of 2012 according to figures from the Census Bureau. Plastics are down in value by approximately 4% to $468 million and by volume by approximately 3% to 991,000mt. China, Hong Kong, Canada, India and Mexico make up the largest export destinations in 2012, coming in at $247 million, $95 million, $50 million, $24 million and $7 million, respectively.